Could you please tell us more about WFX? WFX was founded in February 2000 and since inception has been providing webbased collaborative enterprise solutions for the fashion, apparel and related industries. WFX solutions are used by over 9,000 users in 12 countries to design, develop, and deliver more than $3 billion worth of products for the world’s leading manufacturers, brands and retailers. 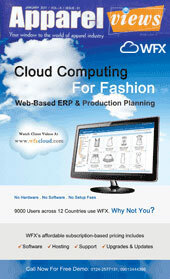 One year ago, we launched the WFXcloud.com ERP software with a handful of customers. Now, we want to build a campaign to create an awareness of what we have been doing with this technology and how customers can benefit from it. What is the WFX Cloud? The WFX Cloud is the world’s first service to provide Enterprise Resource Planning (ERP) software exclusively for the fashion industry, on Cloud Computing. This software manages the entire fashion product lifecycle, from order management to billing, and from production planning to inventory control. WFX plans customers’ resources efficiently, within budget and across all offices and locations. We believe that software should be easy. Users shouldn’t have to worry about the headaches of managing an ERP, and with WFX Cloud, they don’t have to! What do you mean by Cloud Computing? What are the advantages of this service? With WFX Cloud Computing, customers don’t need to buy software or hardware. There is nothing to setup and there are no installation or maintenance fees. This service handles everything from A to Z. Users can access the ERP software from anywhere through the Internet, just like gmail or yahoo mail. Moreover, customers don’t need to worry about AMC, support, backups, or antivirus. It’s an all-inclusive plug and play service. Besides, the most important key feature is that it has inbuilt tools specific for fashion and apparel. In terms of investment, how is this software different from others in the market? In the past, most companies have been hesitant to invest in such systems primarily because of the high investment in terms of cost and effort. That has been the main problem with traditional ERP systems. A customer would first need to buy a server and the server side software like database licenses, server operating systems (Windows 2000 etc.) After this they had to buy the actual ERP software from the software company, pay for server maintenance, backup, support, antivirus and incur other costs for running and hosting the system. Finally, also pay an annual maintenance fee to the ERP software provider. A lot of hidden costs are incurred in running a traditional ERP system, the actual ERP software is just one part. Now, with Cloud Computing, customers only pay an affordable monthly subscription fee and everything else is taken care of. There are no set up charges and customers don’t need to invest in any further hardware or software. WFX subscription fee includes software, hosting, support, upgrades and updates. This means our customers are always on the latest version. WFX regularly updates and upgrades the cloud service and all of these features are accessible to all users at no extra charge. With this we enable our customers with software tools to manage their business in an efficient way at a very reasonable price. With this model, even smaller businesses having only a handful of users can leverage the benefits of strong information management tools and the latest ERP software technology. What kind of response have you received for this service? Could you please name some of the companies that are already on the Cloud? The response has been extremely encouraging. Some of our recent customer implementations are Modelama Exports, Simran International, Achievers Creations, Maestro Engineering, KDC to name a few. The best part of the WFX Cloud is that companies of all sizes can use it. How do you help first time users who don’t have enough expertise in using such software? With no servers, installation, or software required, WFX makes implementation as straight forward and simple as possible. We guide new users through a step-by-step pre-defined training programme.Trained WFX specialists work closely with users and departments to ensure that the solution is rolled out successfully across the organisation. Training takes place at the customer's premises on-site, and is specific to the needs of each customer. A project manager is assigned to monitor progress and ensure milestones are met and in parallel, regular progress meetings with management take place to finetune the rollout. Finally, continuous support following training helps ensure that customers make the best use of the solution so as to achieve the quickest return on investment. What are the other highlights of Cloud based ERP system? Besides the ability to securely access the ERP on the Cloud from anywhere in the world, WFX offers very unique features to drive down product costs for our customers. We have in-built budgeting controls that ensures within budget procurement and an integrated graphical production-planning module that enhances factory capacity management. These tools are unique to WFX and are not available in any other ERP in the market today. Service is a very critical part to be offered in case of such software. How does your company take care of the service? We always try to exceed customer expectations. Providing great service is really very hard. From maintenance, onsite or remote technical support, online assistance, to training and consulting, our company puts a priority on receptiveness and convenience for its software customers worldwide. This is why we offer worldwide customer support 24 hours a day, seven days a week. Our support technicians are available to assist users with their day-to-day technical and functional queries. Besides, we work closely with customers to provide superior support and encourage their feedback. Customer’s feedback provides us with the most relevant information on the functionality and features of WFX products. This helps us in coming up with new products and upgrading our existing products accordingly.